Oh Sew Quaint | Handmade Sewing Gifts and Sewing Inspiration: Pattern Review: B5708 1953 Vintage Dress - A pattern that may well have been drafted by Satan himself. 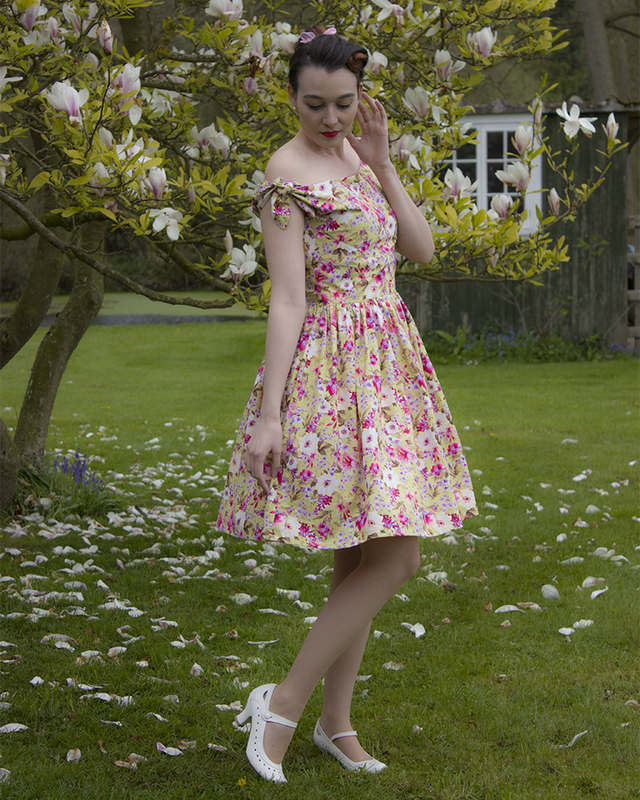 When my eyes landed on the B5708 Retro Butterick 1953 dress sewing pattern I knew it was something I would want in my wardrobe, so decided to get this pattern along with this gorgeous cotton from Sew Essential. Whilst waiting for their arrival I did some research on the pattern itself, seeing what others sewists had made and any tips for it's construction. This is when I learned the alarming news that this pattern does NOT have a good reputation. It's known for being poorly drafted, which results in bodice being too large to wear modestly. A problem that could be prevented with some pattern adjustment? Think again, the bodice is cut entirely on the bias which makes pattern adjustment a nightmare. Looking back on my sewing journey with this pattern, I know my sewing skills could have been better. Towards the end, my sewing was sloppy which no doubt prevented my seams aligning at the top of the zip, the mess I made of the lining under the arm could have been prevented by trimming the seam allowances and taking more care when sewing. The bodice is distorted due to a mistake I made when attaching the lining on the inside also. The busy floral print fabric helps to hide the multitude of sins in the construction of this bodice! 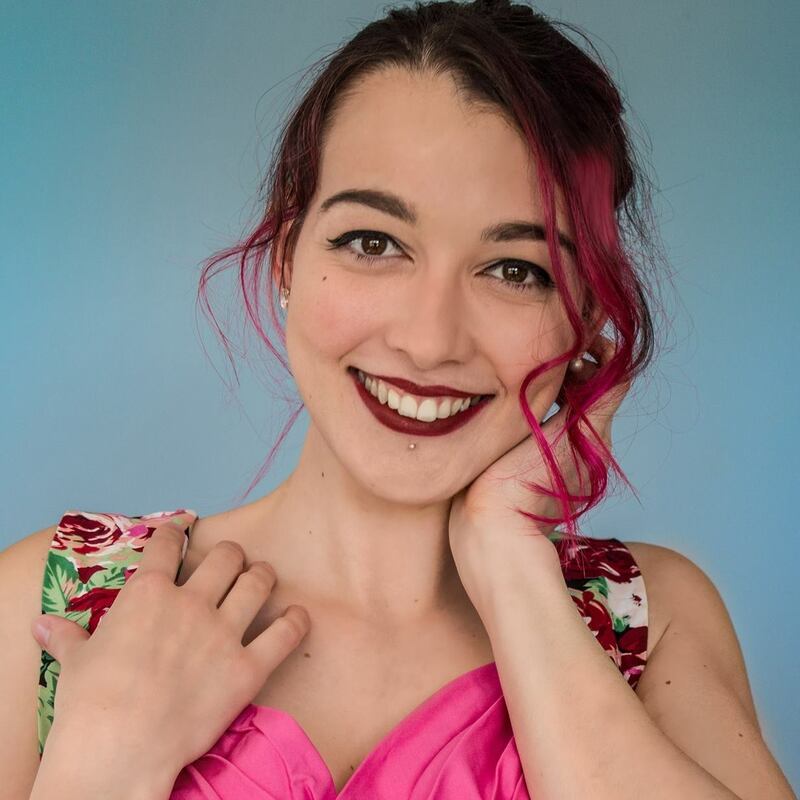 But once I had initially tried on the dress, I knew any mistakes I had made wouldn't have bothered me as the dress only just fit, and I didn't care for it enough to adjust it, and rushed to get it finished so I could move on. I sound as though I hate the dress - I don't. In fact, I am in love with the fullness of the skirt and I really love the fabric. I can't see this pattern revisiting my sewing table as I didn't really enjoy the construction process, but I will be using this skirt pattern again without a doubt. The full skirt in this pattern looks excessively large at first, but makes you feel like a princess when it's on. I'm really pleased with the fabric, it's a good quality cotton poplin at a reasonable price and a pleasure to work with. The floral pattern contains some unexpected but beautiful colour combinations, and I would thoroughly recommend a browse of the Sew Essential website as it has been updated with some gorgeous new floral cottons recently which I will likely be purchasing myself very soon. 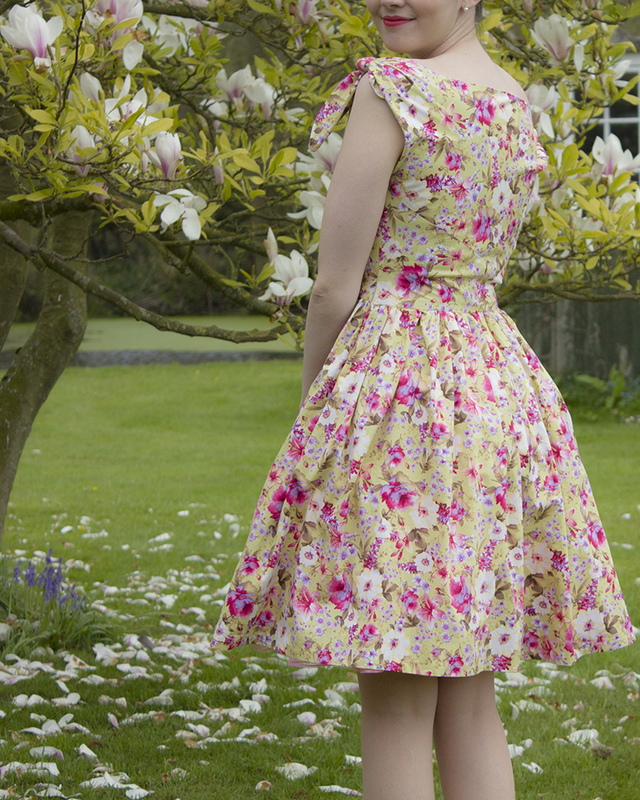 Overall, if you really love the look of this dress I would say give it a go but don't use your best fabric, a cheap and cheerful cotton is perfect for an attempt on this dress. If you are new to sewing, I would look to other patterns but an experienced sewist wouldn't stumble over the techniques needed for this dress. The ties on the B5708 sewing pattern are designed to be worn in 4 different ways, pictured is View A.
I would say positives of the dress are the beautiful full skirt that can be easily adapted to other patterns, and the dress only requires 5 pattern pieces. The merits stop there though, as I think this pattern uses more fabric than most would like to use (You'll need between 4-5 metres! ), it's unlikely the bodice will fit you and the pattern instructions are a bit vague. The result is a stunning vintage dress on the hanger but once you've eventually got it on after trying to tie the dress in a way that sits right for 10 minutes, the work put into sewing the dress up just doesn't feel worth it. Have you made this dress? How'd did you get on, did you have more success than I did? 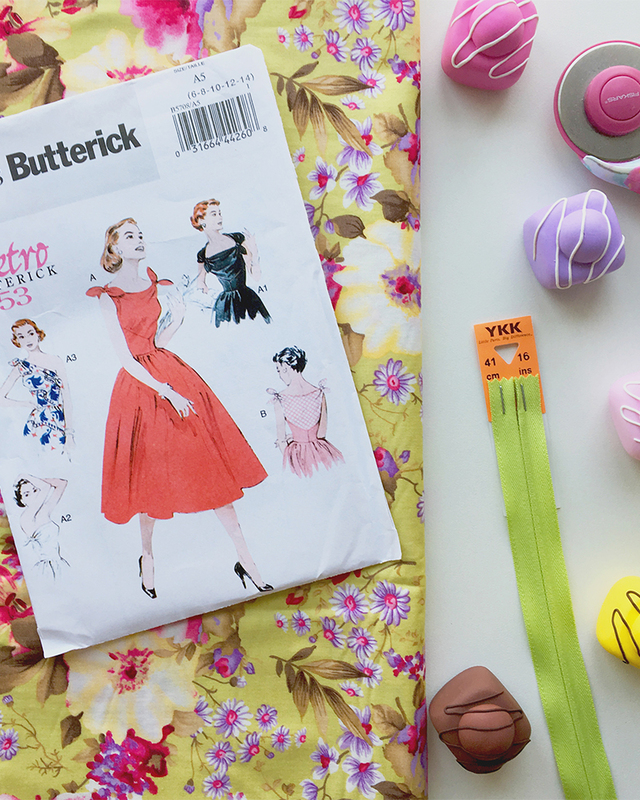 Perhaps you'd tried other patterns in the Retro Butterick series - what vintage items have you made or are planning on making? Share your story in the comments below. 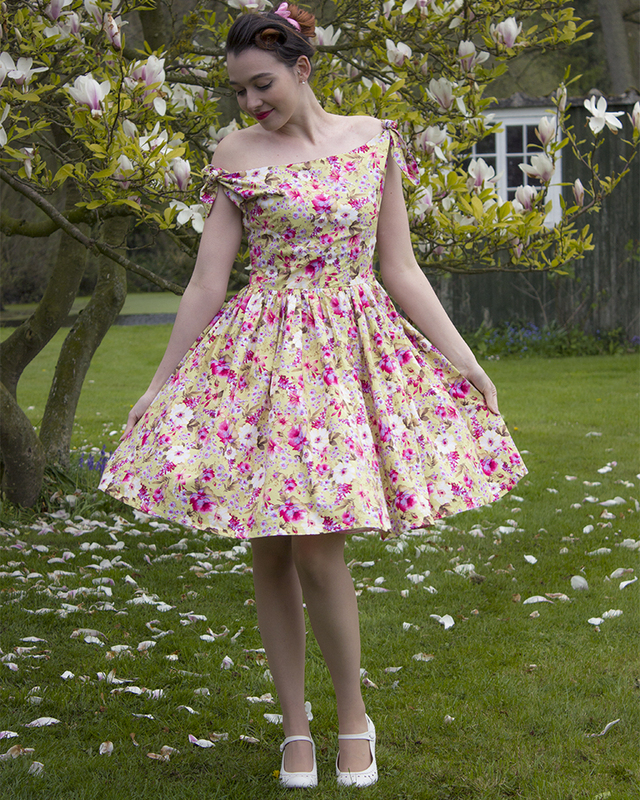 *The pattern and fabric were supplied to me by Sew Essential for review purposes, all views are my own.